Many men would love to be like James Bond; that famous British spy renowned for his stylish look and signature introduction. Likewise, many women would love to date or marry James Bond. If there is one lady who is lucky enough to get that wish in real life, it is Keely Shaye Smith. Smith is the gorgeous wife of Pierce Brosnan, one of the most famous actors to play Bond. The couple share one of Hollywood’s enduring unions. Find out more about Smith here, including her career as a journalist and activist. Keely Shaye Smith was born on the 25th of September 1963 in Vallejo California. There is not much information about Smith’s family or educational background. However, it is not hard to see that she is a well-educated lady. Keely Shaye Smith commenced her journalism career in the 80s and has gone on to work for different TV networks. She has served as an environment respondent for the Home Show on ABC. She has also worked as a gardening correspondent for ABC’s Good Morning America. Smith specialises in environmental issues but she has worked in other areas as well. She worked as an entertainment correspondent for Today Show (NBC), Entertainment Tonight (CBS) and World Entertainment Report (HBO). Asides from journalism, Keely Shaye Smith has worked in the showbiz industry. She has modelled, as well as acted in several TV series. She is also a producer, she produced and hosted a show on PBS known as Home Green Home. 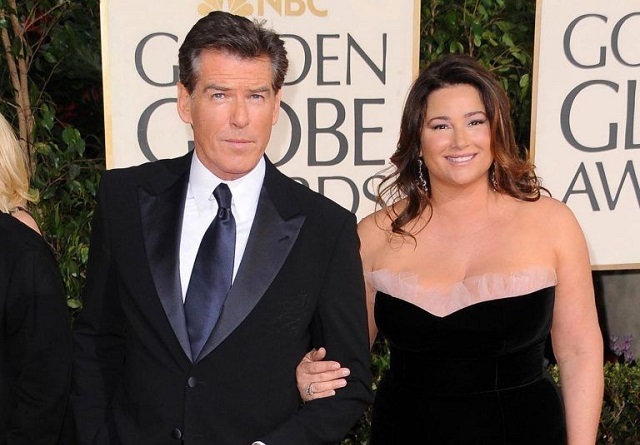 Keely Shaye Smith is married to popular actor and activist Pierce Brosnan, born in Ireland on the 16th of May, 1953. He grew up in Ireland and London. He was mostly raised by his mom after his dad bailed on the family. Brosnan finished school at the age of 16 and joined a circus for some time. He eventually studied acting at the Drama Centre London and graduated in 1975. Upon graduation, Brosnan participated in several stage productions during which he rose to fame. He later became a household name in Hollywood, thanks to the NBC series Remington Steele. Since that breakthrough, Pierce Brosnan has featured in highly acclaimed movies such as Mamma Mia, Mrs Doutbfire, The Fourth Protocol, and The Matador. He also portrayed James Bond between 1992 and 2005; appearing in four movies. Keely Shaye Smith and her husband first met at a beach party in Mexico in April 1994. Smith was there to interview an actor while Brosnan was one of the party goers. They were immediately attracted to each other and subsequently commenced a relationship. The couple tied the knot seven years later in August 2001. The wedding ceremony took place at an abbey in County Mayo, Ireland. Since tying the knot, the couple has remained strong together. Brosnan regularly expresses his love for his wife on social media. He also flies her out to his shooting locations just so they can be together. The lovely couple celebrated 25 years of togetherness in July 2018 and Brosnan posted a lovely message for Smith. Keely Shaye Smith and her husband have two sons together, they are Dylan Thomas (b. 1997) and Paris Becket (b. 2001). Their sons have followed their mom’s footsteps and are both models. It must be stated that this is not Brosnan’s first marriage. He was previously married to an Australian actress named Cassandra Harris. They had a child together named Sean. He also adopted her two children Chris and Charlotte. Cassandra sadly died of ovarian cancer in 1991. Charlotte also died of the same disease in 2013. Brosnan has revealed that he was devastated by the deaths. He also disclosed that Smith encouraged him to mourn them freely. Keely Shaye Smith is renowned for her activism in environmental protection. This is a trait she shares with her husband who is equally passionate about the environment. In fact, it is likely that it was this shared passion that brought them together in the first place. Smith and her husband have promoted environmental education in schools. They have also successfully fought the setting up of facilities which they believe will be harmful to nature, one of them is a proposed LNG facility off the coast of Oxnard and Malibu. Smith has received several awards for her activism including accolades from the Environmental Media Association, Malibu Times and Natural Resources Defense Council. The activist is 5 feet 8 inches tall (1.74m) and weighs 70kg (154lbs). Smith’s weight has been the subject of intense scrutiny in the past. When she first rose to the limelight, she spotted a slim figure. However, after the birth of her children, her weight rose significantly. In recent times, Smith has lost a lot of weight, thanks to a healthier diet and lifestyle.